This lower level remodel was aimed at creating an updated space for entertaining and enjoying time with a more grown-up family. Walls and niches in the space, were rearranged in subtle ways within the basement’s existing areas to create a more open and streamlined living space. Finishes were updated throughout to create an exciting and rich palette without distracting from the room’s purpose. 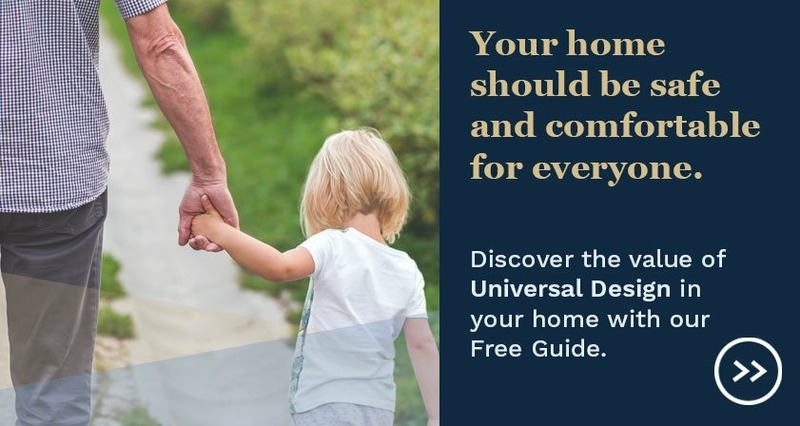 There is still plenty of space for the family to hang out and play. With a family now requiring a more mature space, one of the first challenges was to design a new bar that could accommodate a party crowd without it looking like a frat house. The existing bar (below) consisted of cabinets fitted into a niche, a refrigerator set into an arched niche, and a narrow bar-height counter. Utility took precedence over integration into the overall look of the existing space. An additional niche on the other side of the bar counter accommodated an extra furniture piece for additional storage. A soffit above the peninsula only contained can lights. The new bar (below) uses stonework and black-glazed dark brown cabinets to create a traditional foundation and becomes the centerpiece of the lower level. The two individual niches were opened to a corner cabinet piece for the TV to be placed high and visible for everyone. The refrigerator was relocated to the end of the counter, where the existing corner-cut wall was reworked to a wider flat wall, and a cold-air return vent was reworked to move it out of the way. The new peninsula creates a curve, helping to integrate the corner into all areas of the surrounding room. The stone “column” allowed the insertion of a display niche against a support column that could not be moved. The soffit was removed above the bar for a cleaner look. LED pendant lights take its place. The new peninsula, worked between two “columns” of stone at the base, holds additional cabinets that eliminated the need for the additional furniture piece. The two-heights of Black Galaxy granite provide a space for prep that doesn’t interfere with the eating space above. They are separated with a glass mosaic tile that continues throughout the bar as an accent. Outlets provide quick power to small appliances as needed. 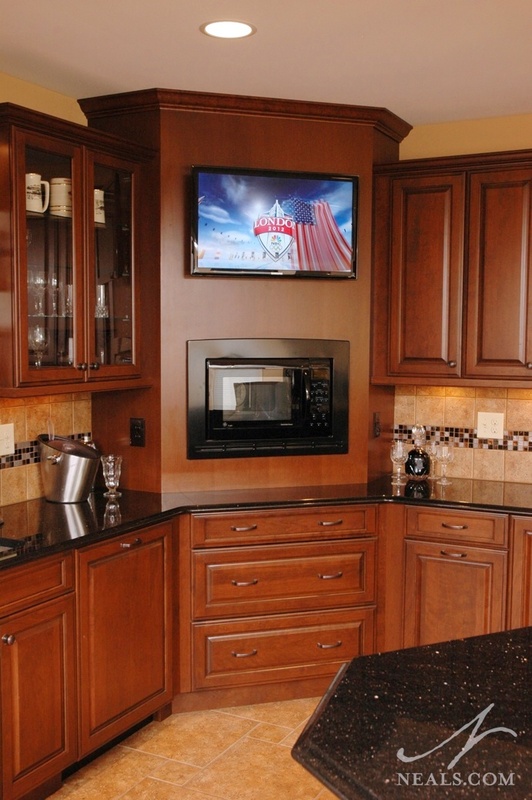 A custom veneered cabinet houses the microwave and provides the perfect place to mount the TV. A wide variety of cabinet types were fit into the space for bar-appropriate storage needs, including plenty of drawer storage as requested by the family. Display shelving and glass-front cabinets on the back wall of the bar provide much needed space for the homeowner’s collections. A sink and fronted dishwasher below make quick work of cleaning up. Challenge #2: The "Play Room"
A small room behind the bar (below) had been useful as a playroom for the kids, but was now under-used. A corner closet with the back also cut off created an awkward angled wall in one end of the room. The windowless room was even drastically cut off from the natural light in adjacent rooms, and the fluorescent lighting, intended to compensate, was just too harsh for this small space. 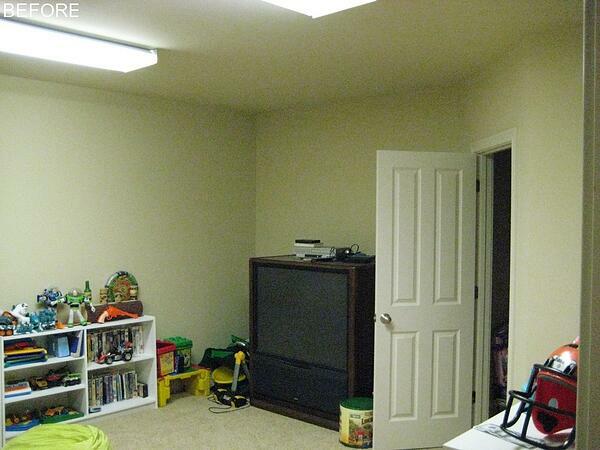 The homeowner’s wanted the old play room to become a home gym. In order to provide an enjoyable space for the family to work out, a new bank of windows was installed on the interior wall, and a door with a full-height window completes the open look. 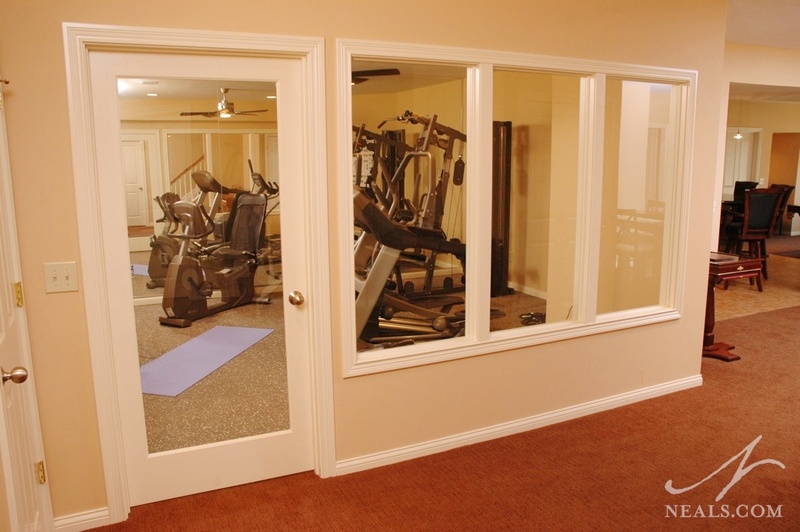 This allows more natural light in from the adjacent space into the gym space. The back wall of the gym was finished with mirrors. 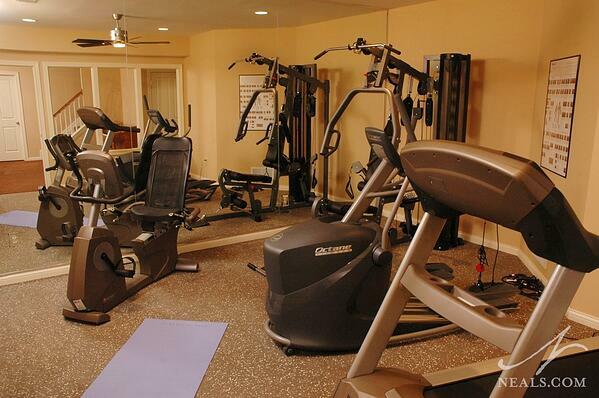 While this certainly added to the gym feel, it also helps reflect light all throughout the space. As seen in the photo above (in the reflection of the mirror) the closet was reworked within the room to a simpler corner jog. 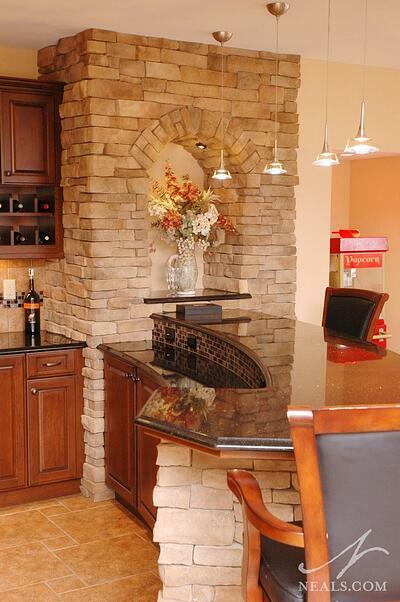 This new wall accommodates the reworked cold air return and steel I-beam column post support. 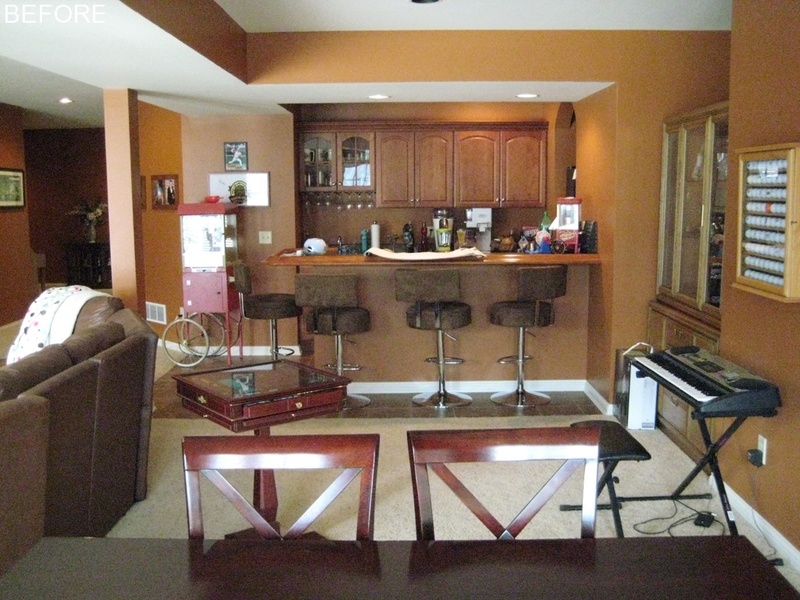 The back side of this wall is notched in to form an expanded bar and accommodate the new location of the refrigerator. It also became one of several new locations suited for the homeowner’s collectables. A large entertainment unit took over the wall of the TV area of the lower level (below), but was cluttered and not a precise fit. 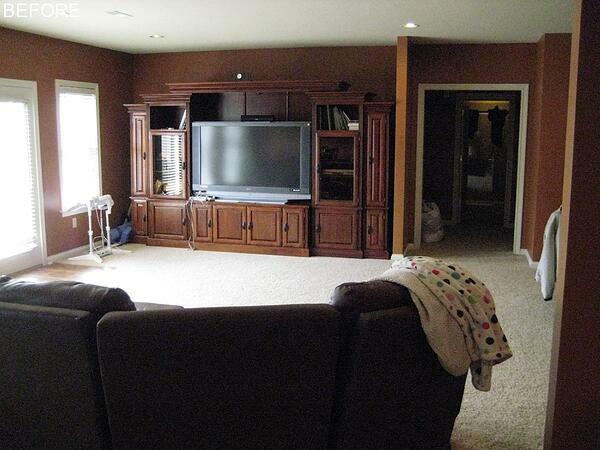 While the space was reasonably sized for the type of movie watching a big, young family usually needs, the homeowner’s required an update to the space to better suit their teenagers as well as their adult guests. The worn-out carpeting in this area also needed updating. 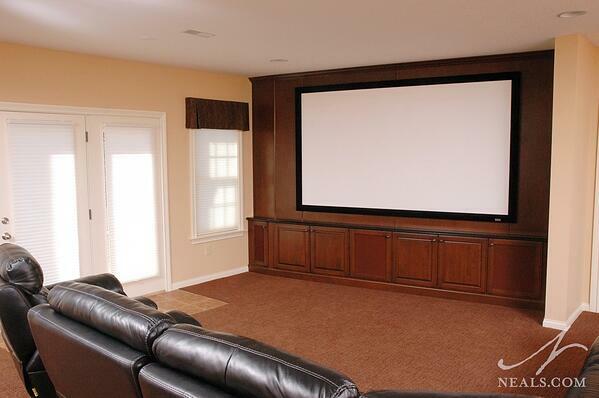 The new home theater takes advantage of the wall by swapping the entertainment unit for a built-in. 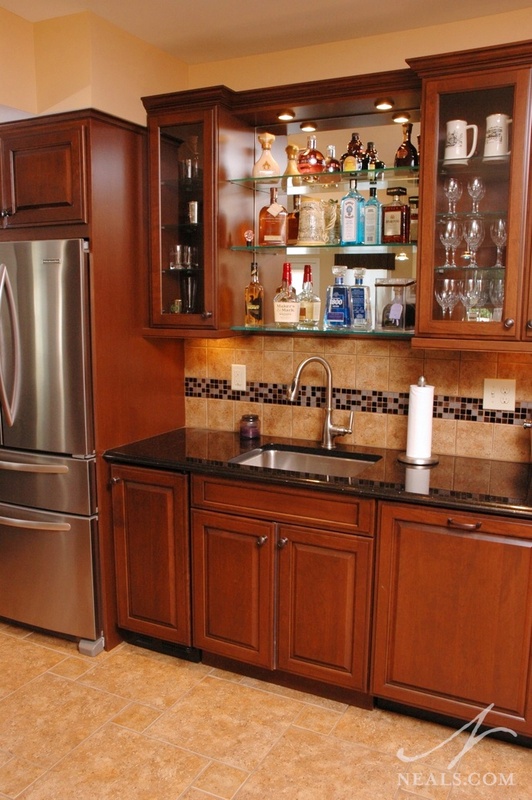 The wall, slightly angled to face the bar area, is finished in the same dark cabinetry. The cabinets hold the family’s media in a cleaner fashion, and with no surfaces for things to sit on, the space remains clutter free for the movie experience. Further streamlining the room, the screen’s projector was mounted on the existing soffit, located between the theater and the billiard room, leaving more floor space below. The carpet was replaced with a light chocolate-colored version that can handle the teenage traffic. The last portion of the lower level was a long narrow space with a great view outside but little else. 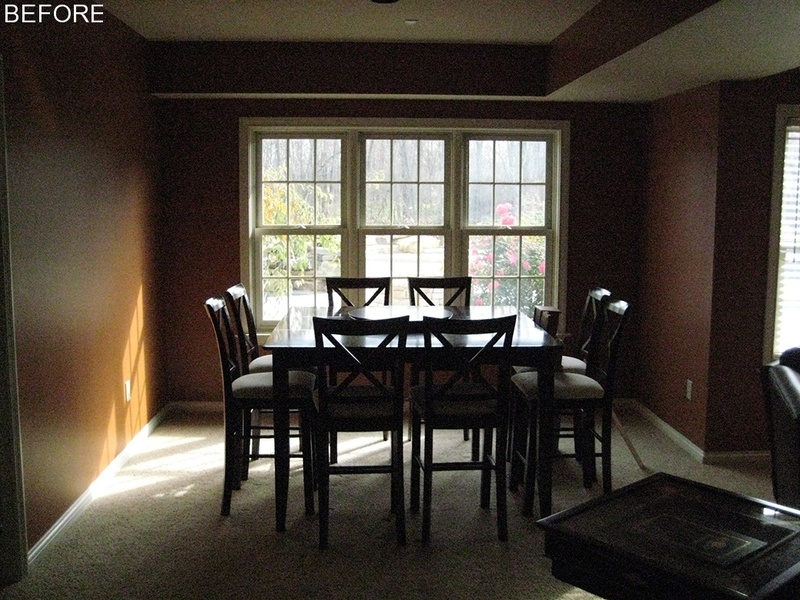 The dining table, which had been great for playing board games, was no longer needed, and the family hoped that this space would be better suited to game playing of a different sort. 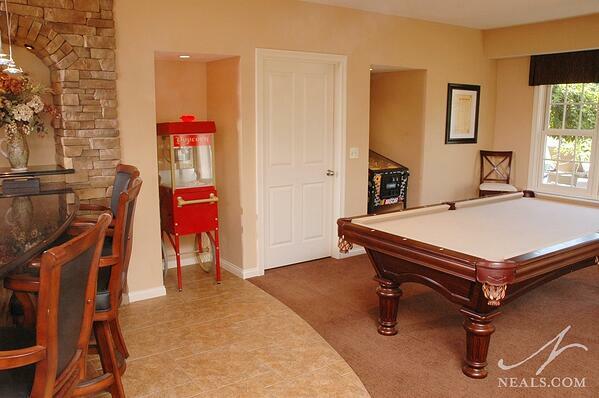 A new billiard table took the place of the dining table in the remodeled space. In order to facilitate movement around the table, the homeowner’s collectables, an oldfashioned popcorn machine and a pinball machine, were set into niches on either side of a door leading to an unfinished storage room. Lights in the niches illuminate the pieces. The tile from the bar area makes a wide arch into the new billiard space, helping to blur any hard distinctions between the two spaces. 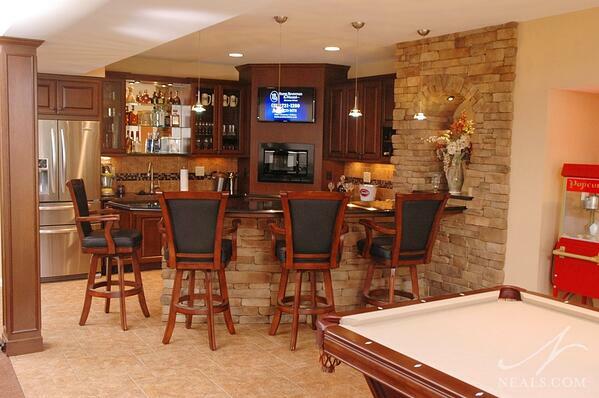 For more basement ideas follow us on Pinterest and Houzz.